Obama And Boehner Are Still Far Apart On Fiscal Cliff, But Don't Panic — Yet : It's All Politics Brinkmanship has long been a mainstay in Washington politics, and so it is still. Which is why it might be too early to give up hope that President Obama and congressional Republicans can reach a "fiscal cliff" deal despite how far apart the sides were Monday. 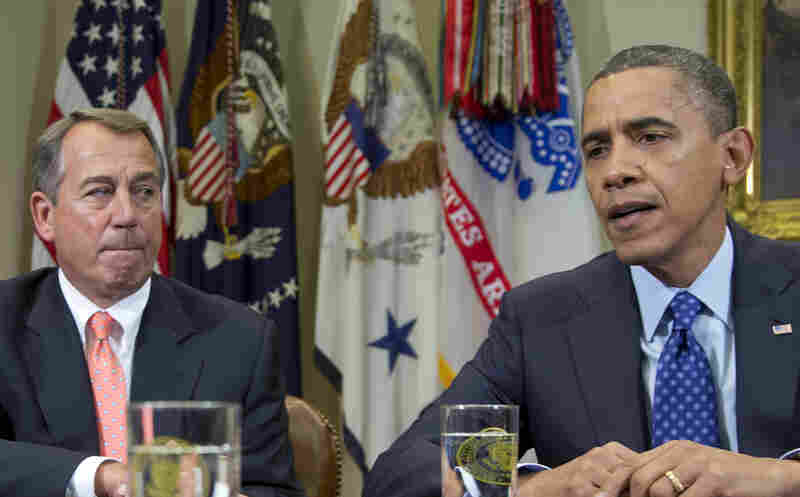 President Obama and House Speaker John Boehner on Nov. 16. It's apparently still too early for any of Washington's top policymakers to start blinking in the "fiscal cliff" stare-down. So there's no need to panic — yet. That's the real message of Monday's congressional Republican counteroffer to President Obama's proposal for avoiding the "fiscal cliff," the combination of major tax increases and drastic spending cuts scheduled for the end of the year. Those large tax hikes and spending reductions could lead to another recession, economists warn. The House Republicans' offer, not surprisingly, didn't include a tax-rate hike on the wealthiest taxpayers, a requirement Obama has said is nonnegotiable if there's to be a pact. Of course, House Speaker John Boehner and other Republican leaders have, for their part, called such a rate increase a nonstarter. Obviously, before this is all over, one side is going to have to yield on this fundamental issue of higher tax rates for couples whose households have more than $250,000 in income (or single individuals with incomes of more than $200,000). Neither side on Monday sounded like it intended to be the first to make significant concessions, however. Answering questions on Twitter, the president insisted his approach of allowing higher tax rates on the top 2 percent of taxpayers was the only way to avoid bigger spending cuts to programs the middle class relies on while still achieving deficit-reduction targets. For his part, Boehner struck an equally unyielding tone in a counterproposal that contained no tax-rate increase and an estimated $2.2 trillion in combined spending cuts and revenue increases. House Republicans relied, in part, on changes that would make Medicare less generous to future beneficiaries. Obama has rejected similar proposals in the past. So far apart are the Obama proposal and the House GOP counterproposal, trying to reconcile them into some sort of agreement by the end of the year seems about as doable as squaring a circle. Conventional wisdom, however, is that the negotiators don't have equal leverage, that the president has the stronger hand. After all, he won re-election on the campaign promise that he would fight for higher taxes on the highest-income taxpayers. Polls repeatedly show that a solid majority of voters support his position. Unfortunately, the nation is getting plenty of experience with these end-of-the-year cliffhangers, so to speak. In 2010, Obama and House Republicans fought until nearly the last moment over extending the Bush tax cuts and long-term jobless benefits past their expiration date, the end of that year. At the end of 2011, the president and congressional Republicans fought over extending the payroll tax holiday until the witching hour was virtually upon them. Then, there was the mid-2011 standoff over raising the debt ceiling limit, the one that led to the downgrade of the nation's credit rating. Indeed, it was the agreement that resolved that dispute that led to the current disagreement between the president and House Republicans. The pact to end the 2011 debt-ceiling fight included the forcing mechanism of the fiscal cliff as a spur to a bipartisan deficit-reduction accord. Clearly, the specter of such spending cuts and tax increases hasn't gotten scary enough to force the two sides to already narrow their differences. But brinkmanship has long been a mainstay in Washington politics, and so it is still. If the offers on the table in a few weeks are as far apart as now, that might be the time to get really get nervous.